Learn how to save on flowers with just a few easy tips. Your yard will look gorgeous this Spring and Summer. Ok… I have such an intelligent way to save on flowers for your garden. We have a pool in our backyard and I have some big pots to decorate the backyard and that really adds up fast. However, it gets so expensive to fill them up with annuals every Summer. I tried to do perennials one year and they didn’t come back, so that was a waste of money. And you know I do not like to waste money. So, I was in search for new ideas to have a pretty yard but not spend a ton and blow my budget. I have accepted the fact that I need to fill them with annuals every year but I’m not willing to spend HUNDREDS of dollar each year to do it. It really is so simple you will wonder why you didn’t think of it before. I know I did once I found out my neighbor’s secret. Let’s get started so you can start planting your own flower pots. You will love these flower pot ideas! 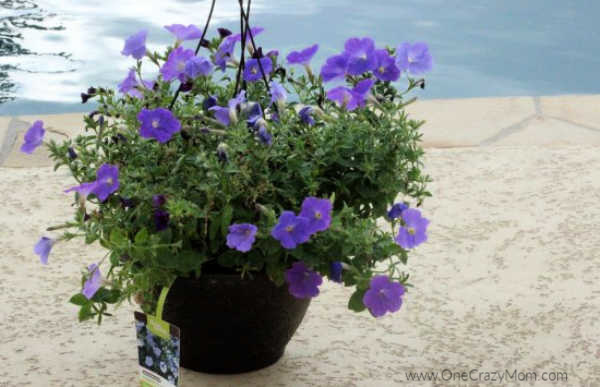 Her secret to fill up her flower pots quickly and still save on flowers is to buy hanging baskets. Yep.. that is the secret. Not so amazing, right? Well… it actually is a nice money saving tip. I don’t know what I never thought of this before. Not only does it save money but it so easy and looks amazing. You just take your flowers out the hanging basket and plant them in your flower pot. No need to break up the basket. Just carefully remove the flowers and plant them in your flower pots. You will have flower pots that look so full and beautiful. No one will guess how little you spent on these gorgeous flower pots. They are going to turn out great. 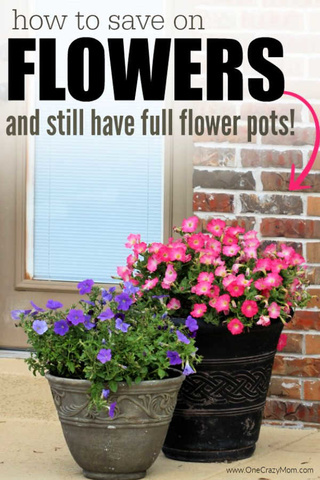 You INSTANTLY have beautifully full flower pots. No more waiting for the flowers to fill out and no more spending way to much money for flowers. If you know me… I like life to be easy. I have 8 kids so I have to find a way to live a happy life without spending a ton of money or taking a ton of time on the little things. I’m all about simple and this for sure is easy. Now that I know how to do this, I plan to buy hanging baskets each year because it saves so much money and time. This just made my day. After about 15 minutes of work, my son and I had filled up 4 flower pots. It really saves so much time. I love this tip and think you will too! Now that you know how to save money on flowers, it is easy! This year I spent $59.96 which means I saved half off from last year. The best part is my flowers already look better than they did last year and I took these pictures the same day I planted them. I just love looking out my back window at these beautiful flowers, especially knowing I saved money this year. So now you know my new tip to save money and time on my flowers. It is so nice to have these gorgeous flowers and know that I spent much less than I normally do AND they look better too! It is a win all around and looks gorgeous. I can’t wait to hear how your flower pots turn out. You need to go plant you some flowers now that you know how to save on flowers! The flowers are going to look amazing that you plant and you will love the money you save. 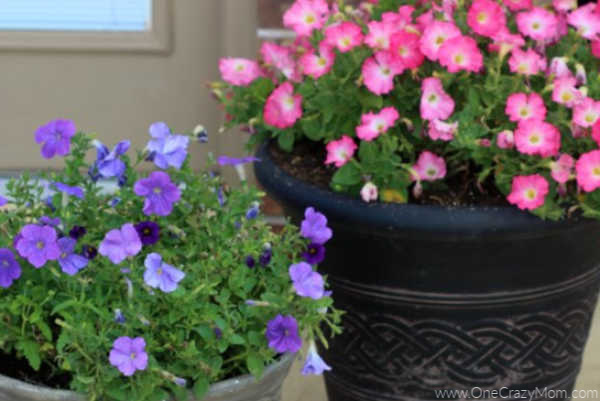 Get started today with these flower pot ideas. Learn 5 Ways to Save Money in the Garden. Do you have any tips to save on flowers for your garden? We love to save money and have a beautiful yard so please share your tips. 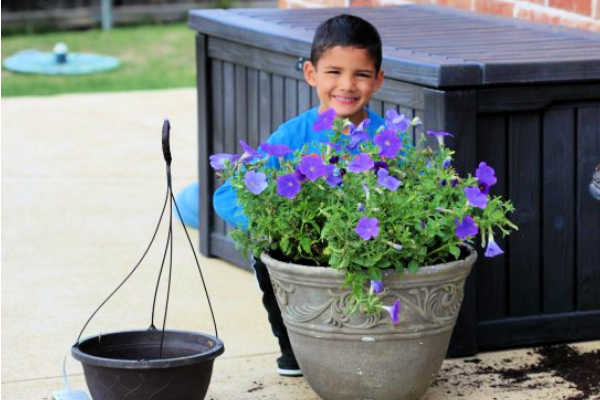 Let us know if you try our easy tips and how your flower pots turn out. Save even more money by getting the flowers on sale or clearance. You can save a ton of money and do this on a budget and still have a really nice yard. 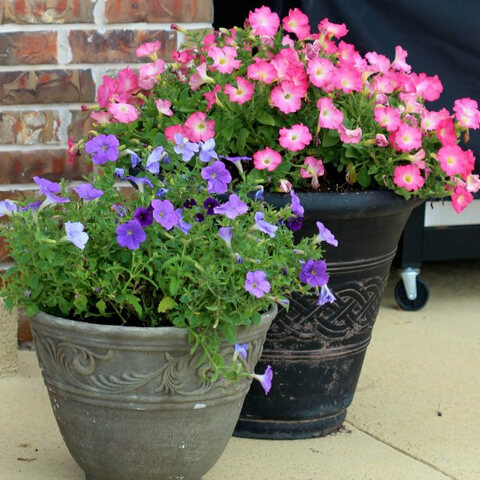 The flower pots will brighten your yard and pull everything together. Get started today with these great ideas. What sort of flowers do you plan to buy this year for your yard? I love all of the different colors and seeing how gorgeous they look together. It always amazes me what a huge difference this makes in our yard for such little effort. 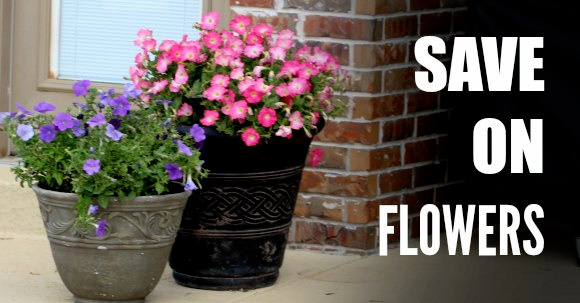 I think landscaping and flower pots and such really leave a big impact on your curb appeal. This is such an easy way to spruce things up on a budget and get your home ready for Spring and Summer. Let us know what your favorite flowers to use are. There are so many great ideas and different flowers to use. I’m sure your flower pots will turn out amazing and you will save money too. It is a win all around and your yard will look beautiful. How we saved thousands on our landscaping! Wow! A true, Aha moment for me. I am SO going to do this! Thank you for the great idea as well as, saving me time AND $! I use same day with geraniums. I find buying single potted geraniums aren’t that big and not cheap either these days. So I buy a big potted type where there are usually 3-4 large, healthy geraniums. I split them as singles and pot each one in individual containers along with hanging ivy etc They look amazing. I calculated cost and it is actually not more expensive. Singles are going for $2.99 ( Canadian) whi,e large potted were less than $10 at Costco. I went to visit my friend in the country. Her property was crawling with periwinkle. Brought that home “ free” for great groundcover…very hardy, easy to care for those of us who may not have a green thumb or forgetful in watering…. and comes back every year. Great idea, thanks for sharing your idea. I pinch off trailing ground cover and transplant it to my pots for fillers.